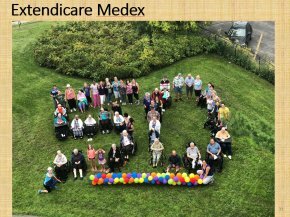 On August 21st, Extendicare Medex joined the nationwide 50th celebration of Extendicare. The residents and team members at the home had a great time creating a human 50 to mark Extendicare's 50 years of helping people live better. 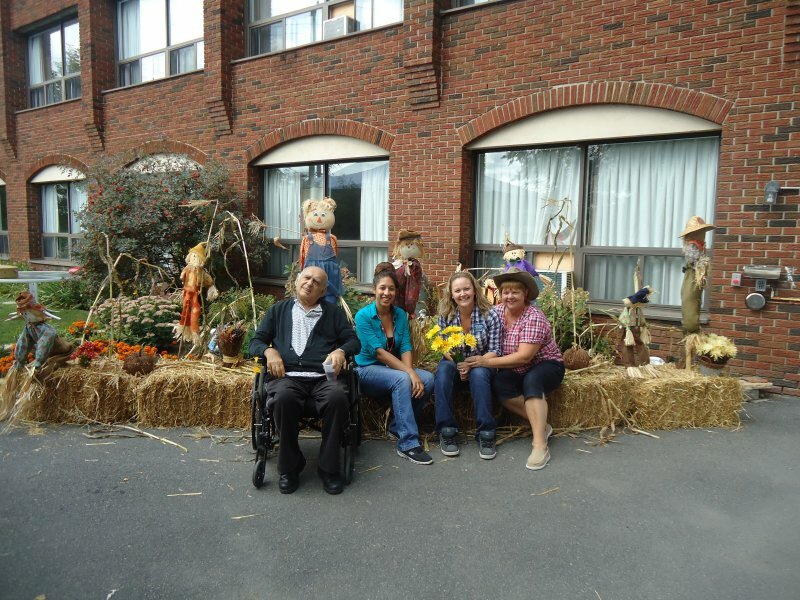 Two residents at Extendicare Medex were granted a wish. These two residents wished to go to see the Ottawa Senators play against the Boston Burins at the Canadian Tire Center. 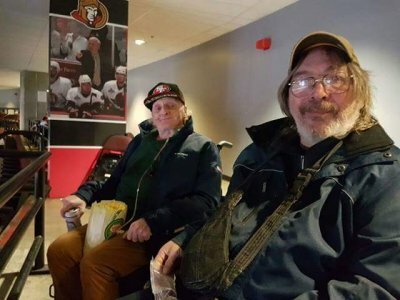 One resident was an Ottawa fan and the other was a Boston fan. The men enjoyed a cold drink and popcorn while cheering their teams on. 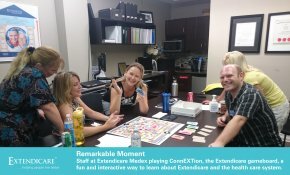 Staff at Extendicare Medex playing ConnEXTion, the Extendicare game, a fun and interactive way to learn about our great organization. 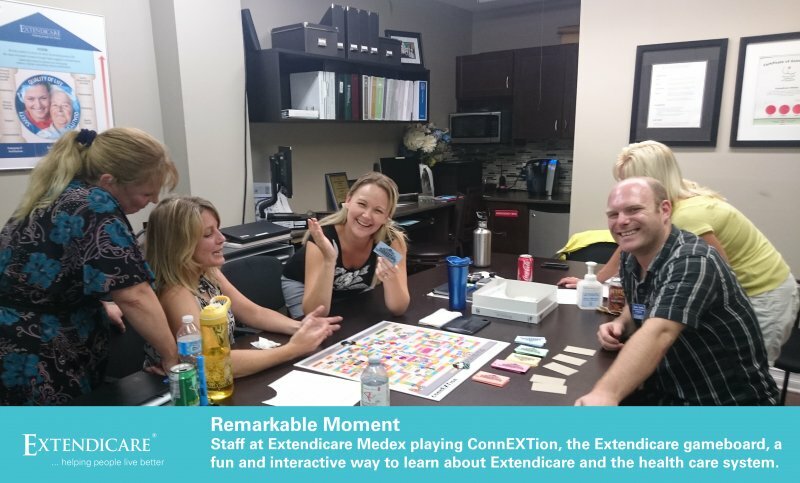 Staff at Extendicare Medex playing ConnEXTion, the Extendicare game, a fun and interactive way to learn about Extendicare and its division while navigating through the health care system. We learned something new about our great organization while having lots of fun. Extendicare Medex recognized and celebrated our dietary department. For the week of August 22nd – August 26th We recognized and celebrated our dietary department. 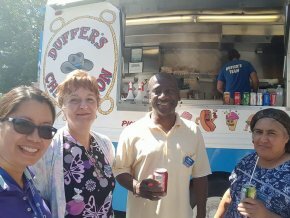 We had Duffers Chip Wagon come to Extendicare Medex and served all 193 of our residents their lunch on Tuesday August 23rd. They had the choice of a chicken burger or sausage on a bun with fries and onion rings on the side. The residents really enjoyed this and had nothing but great things to say about it, and already can’t wait for next year. Then we had Duffers Chip Wagon come again on August 24th to serve all of the staff working that day a free lunch and our night staff got a pizza lunch delivered to the home at night since they could not participate. We also had a Jello eating contest on Thursday for all staff to come and try to eat Jello off of a plate in the least amount of time for the prize of a beautiful fruit basket. The staff and residents enjoyed watching how funny it was for someone to try and beat other staff members time, and what they looked like with Jello all over their face. On Friday our last day of celebrations we had a pot luck in the park, where staff were able to get away from the office and have a nice afternoon outside with coworkers and play games and eat, eat, eat.  Extendicare Medex has a recognition week for each department yearly. This celebration is for all staff to enjoy and we have a lot of fun every year. On Wednesday, June 1, 2016, we had a very special intergenerational and community outreach program here at Extendicare Medex. 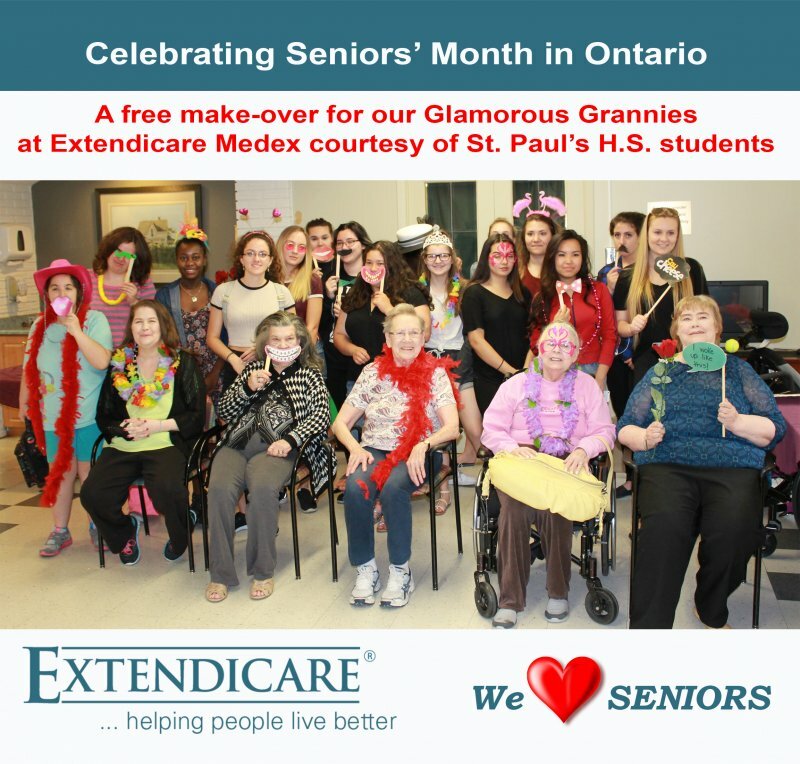 Students in the cosmetology program at St. Paul's High School came to our facility to partake in 'Glamorous Grannies'. 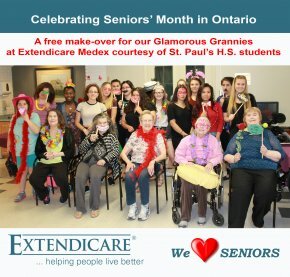 Our residents were treated to free makeovers provided by the students. Their nails were painted, their hair styled, and their makeup artfully applied. Once they were all dolled up, residents and students had fun in a playful photo booth, complete with feather boas and wacky props. Strawberry cupcakes and delicious spa water was served to complete the glamorous experience. A fabulous time was had by all! Ms. C came to Extendicare Medex Nursing Home in the role of part time registered nurse on nights, in 1972. It worked out great for the young wife and mother, as she lived close by with her husband Mr. A and their three young children, and greatly enjoyed caring for seniors. So it just seemed natural that when Mr. A. 's mother needed a long term care residence in 1994, that Extendicare Medex was chosen. Mr. A. and Ms. C visited Mr. A's mother Mary daily, until she passed away in 1995. By that time Mr. A. had gotten to know quite a few staff, residents, and family members, and so decided to take on the position of volunteer bartender at Happy Hour every Friday afternoon. 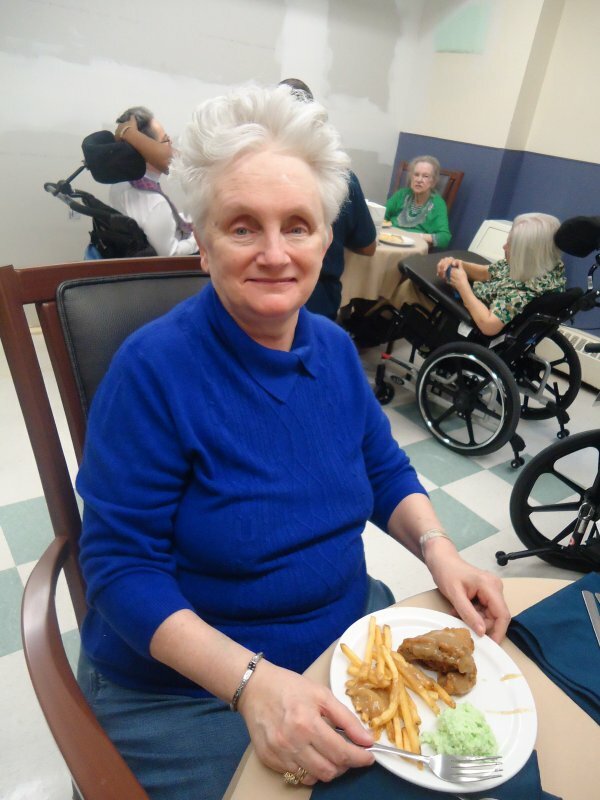 Fast forward to February 2016, it was determined that Ms. C. needed long term care. 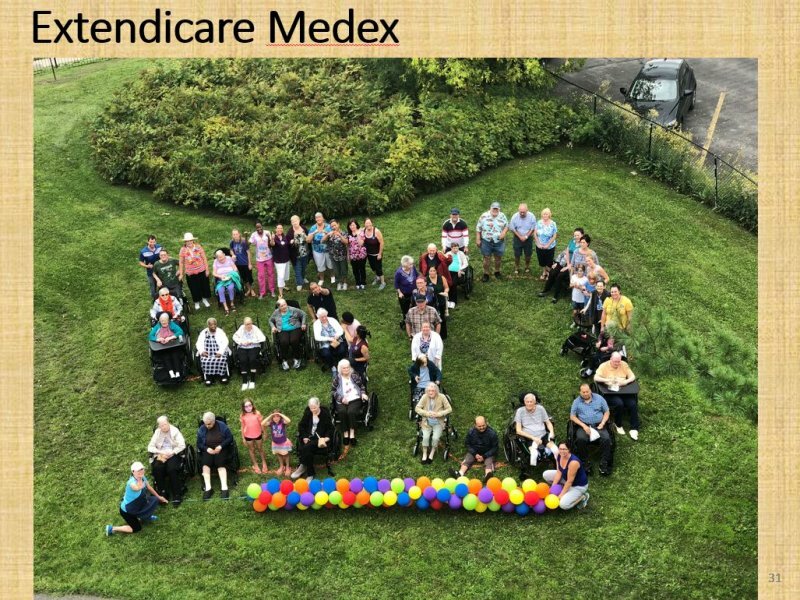 Extendicare Medex was immediately the couple’s first choice, as it had become a place with many meaningful connections for both Ms. C. and Mr. A. 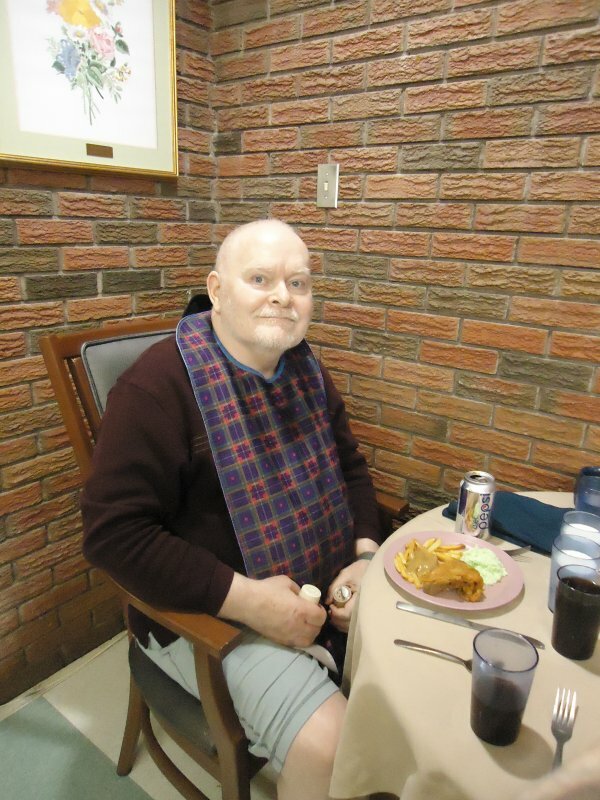 In his twenty years as a volunteer bartender, Mr. A. had become a regular fixture at Extendicare Medex, and friendships had been built that extend outside the nursing home doors, and included both him and his wife. Now it is Ms. C.'s turn to receive nursing care on the floor where she once worked, and enjoy visits with her now grown up children, Mr. A is here daily and of course Ms. C. sits faithfully by the bar every Friday, and enjoys the live music, as Mr. A performs his bartending duties. 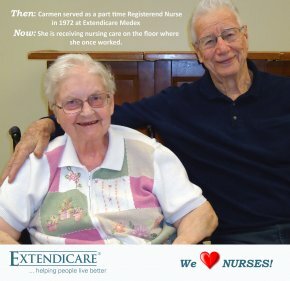 Extendicare Medex had indeed served Ms. C and Mr. A well throughout the years, but this generous couple has also served Extendicare Medex in a multitude of roles, from employee, to family member, to volunteer, to resident. For the Ms. C and Mr. A. family, Medex has truly become the common thread that binds. Something different for our residents! 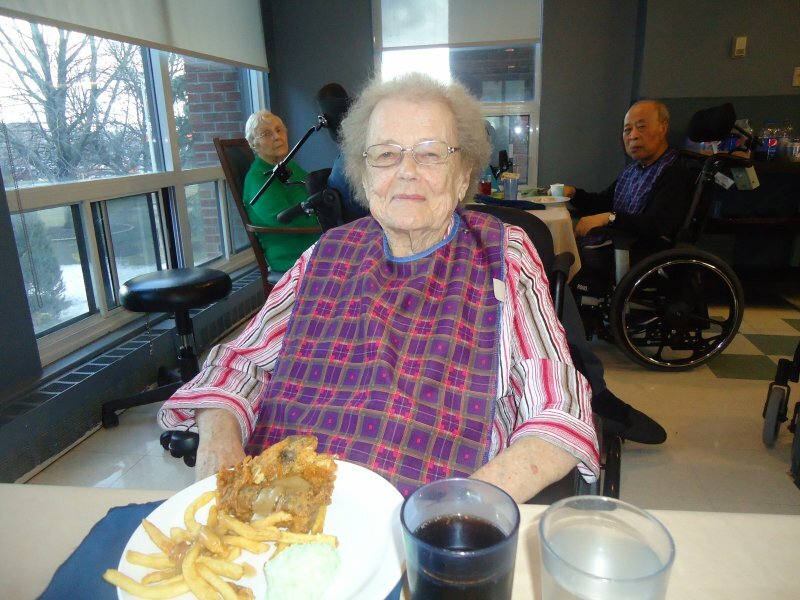 On March 17th the dietary department organized a KFC dinner for the residents here at Medex. They replaced the meal with a favorite fast food restaurant that the residents got to choose at food committee meeting this month. It was a huge success, residents were very happy to have a nice order in meal that most of them wouldn’t normally be able to go and get themselves. The Dietary department did an excellent job preparing the different diets needed for our residents so everyone could enjoy this meal. We will be doing more in the future with different choices for dinner. Medex had a Country and Western themed day. 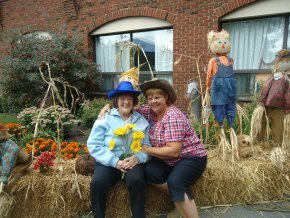 Residents and staff enjoyed dressing up in their country gear for the day. We also had a big happy hour country themed party in our back patio that afternoon. We had live entertainment from Mike Fahey with drinks and food. Our residents families and staff were down to participate in the party and enjoy the music and food. 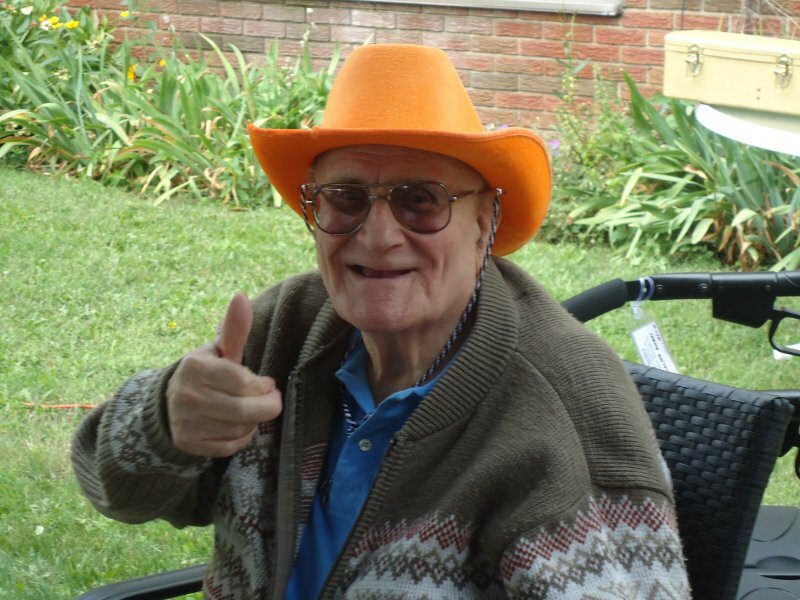 One of our residents said he really enjoyed the entertainment and the decorations at the party. 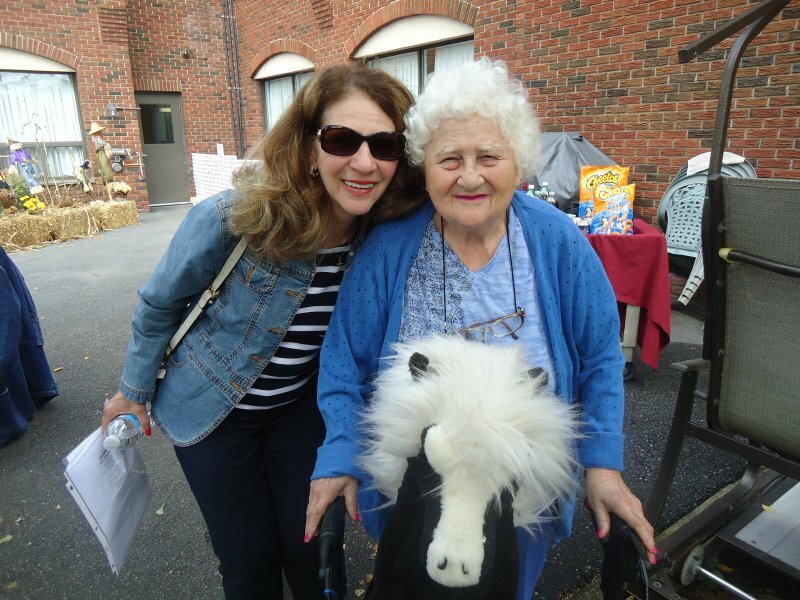 Our staff enjoyed this time to socialize with the residents over a soft drink and chips. This is a great way to get staff and families involved in the programs offered in the home so we can all have fun together! !